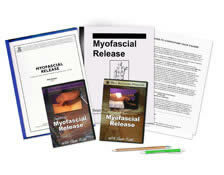 Already own the Beginning or Advanced Myofascial Release DVDs? Call us at 1-800-364-5722, 9am to 5pm, to discuss your enrollment options. Identify 3 types of connective tissue and properties of fascia. Understand cross-linkages, adhesions and 4 rules of myofascial release techniques. Experience the fascia in your own body. Explain the importance of skin in joint mobility and how to release the superficial fascia. Describe 4 scar release techniques. Utilize kinesthetic evaluation for ankle, knee, hip and spine. Identify 3 fascial lines and show how to use cross handed stretches for each line. Use myofascial techniques to release the three transverse diaphragms. Determine areas of restriction by evaluating posture. Using anterior, posterior, and deep anterior fascial lines, evaluate and release posture. Explain how to release the rib cage, diaphragm, and accessory muscles of breathing and how to handle emotional release during a session. Manipulate fascia of the feet, balancing the three arches. Demonstrate myofascial techniques to balance and level the hips and back. Balance shoulders and arms using myofascial release techniques. Perform the vertebral artery test and myofascial release techniques to balance the neck and torso. Balance the head, freeing the jaw and loosening the scalp.